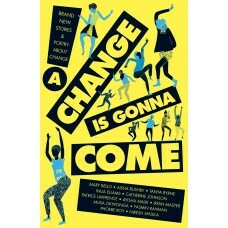 A Change is Gonna Come is an anthology of short stories and poetry by authors from black, Asian, and other minority ethnic backgrounds, all on the theme of change. It has a host of top YA authors, including Tanya Byrne, Catherine Johnson, and Patrice Lawrence, but it also includes four stories by previously unpublished authors, which I think is fantastic. I honestly couldn't tell the difference between the two - all the pieces are polished, succinct, interesting, and with engaging characters. All of these authors really deserved to be in the book. I liked Catherine Johnson's story about a circus showman in the 1800s, and I liked the science fiction story about young criminals in Brightonstone - in fact I'd like to be an entire novel! I think that's the beauty of a short story - they often leave you wanting more. I was provided with a copy of this book by Little Tiger Group/Stripes Publishing, so thank you very much to them for that. This is a great anthology and I'll definitely be recommending it.